Andy H: A double dose of Spidey kicks off this week's pull list. 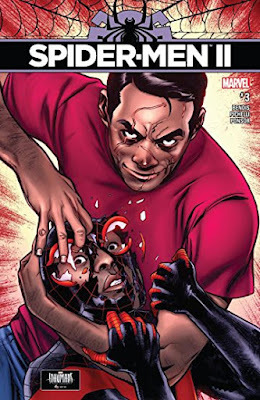 Spider-Men II #3 continues its excellent run as Brian Michael Bendis and Sara Pichelli mix it up for the Miles Morales of both worlds. So far this has been a worthy sequel to the original series and the gorgeous art of Pichelli is the icing on the cake. While this title has a serious vibe running through it, Peter Parker: The Spectacular Spider-Man #4 has a much lighter tone. Chip Zdarsky captures the quirky and fun side of the Spidey we all know and love and this issue we get the added bonus of some J. Jonah Jameson action to look forward to. Diving right back into the darker side of comics we have Dark Ark #1 from Aftershock. Written by Cullen Bunn (does this guy ever sleep?) we get a different view of the great flood. Where Noah filled an ark full of animals, the sorcerer Shrae is set the task of collecting the more unnatural animals, such as dragons and vampires. And finally it's Simpsons: Treehouse Of Horror #23. A bit early for Halloween but always a great read every year. This issue includes a familiar-looking tale as we learn that as kids, Marge, Homer, Lenny, Carl and Barney were tormented by a clown that lived in the sewers. What a cracking idea for a story! While I did say that was my final pick of the week it would be wrong to miss out on Shirtless Bear Fighter #4, the penultimate issue of my favourite comic of the year. Great fun. Okay, that's really it this time. Kenny J: Invincible #140 hits the stands this week and, as Robert Kirkman's second longest-running book, I'm wondering if this really is the end of all things. 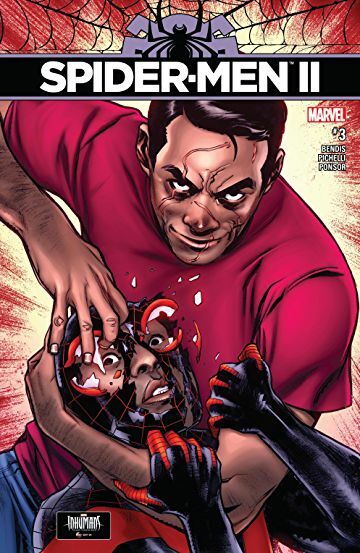 With carnage and blood and closure on a lot of threads I think it may well be, however, it wouldn't be the first time this comic has called my bluff and part of me hopes it's going to be the same this time as I want this book to stay around a lot longer. Another invincible character I hope sticks around for a while is Riri Williams, the new and improved Invincible Iron Man, or Ironheart as she's now known. She has been my favourite recent addition to the Marvel Universe and with the impending return of Tony Stark I hope she doesn't get relegated to supporting cast. I'll continue to read any book she headlines and Invincible Iron Man #11 is no exception. The recent storyline in Batman has been a staccato insight into the Dark Knight's arguably best known villains. Two Arkham inmates on opposing sides of crazy, one the instigator of chaos, the other obsessed with puzzles and control. I didn't quite gel with Tom King’s vision for Bruce Wayne at first but this recent 'War For Gotham' angle has me picking up and enjoying Batman again. Wild Storm #7 sees the return of Warren Ellis’ reboot of the eponymous universe. It has been a while since my last dose of covert ops, Machiavellian business leaders and bleeding edge technology. You could argue that this is just Ellis doing what Ellis does but that, for me at least, that is never a bad thing.